As you already know, I post tons of photos. Just so happens, this photo was used in a children’s book! The book is titled “WHY ARE TURTLES SO CRAZY AWESOME?” and is now available on Kindle. Also, the book is available for FREE today for Earth Day, so please download. FYI – You don’t need a Kindle to read Amazon eBooks. With Kindle Apps, you can read Kindle books on your computer, Iphone, Ipad, Blackberry, or Android. More info about that can be found here: Free Kindle Reading Apps on Amazon. Comments Off on Happy Earth Day! Get A Free Turtle Book! This photo came attached to an interesting article regarding the masses of jellyfish that are swarming to a national park on the small island of Cabrera. (That’s to the south of Majorca, Spain, for those who didn’t know, like me.) Apparently, there are too many of them to clear and the environmentalists are losing the battle. If you were following the blog this Monday, you were introduced to Gamera, the handi-capable tortoise. Today, I thought you might want to be introduced to it’s namesake. Meet Gamera, the a giant, fire-spewing turtle monster! “A new oil spill in the Gulf of Mexico has created a mile-long slick after a tug boat struck an abandoned well off the Louisiana coast. A crew was scrambled from the Deepwater Horizon clean-up operation after the collision sent a plume of oil and gas 100ft into the air. The spill in Barataria Bay, which is surrounded by wildlife-rich wetlands, is at least the third leak since in the area since the BP oil catastrophe began on April 10. The area of ocean 65 miles south of New Orleans would normally be occupied by fishermen, shrimpers and oystermen, but it has been deserted since the BP spill began. The abandoned wellhead burst in the early hours of Tuesday morning after being hit by a tug boat that was pushing a dredge barge. 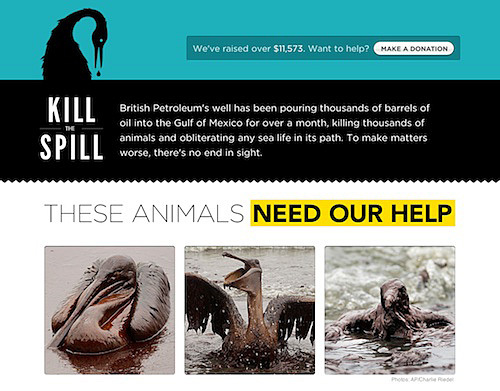 Kill the Spill Website - Help Fight the Oil Spill and Save Animals! Looking for a way to help out with the oil spill? Check out this website by the Metalab, Campaign Monitor, SquareSpace and WooThemes websites titled Kill the Spill. They’re matching up to $35,000 worth of every dollar donated. You can make a donation as small as $10.00 and help make a difference for the animals affected by the oil spill. Join Hands Across the Sand on June 26th! Join Hands Across the Sand! Looking for something to do tomorrow? Why not participate in Hands Across the Sand? It is a worldwide gathering opposed to near- and off-shore oil drilling in our waters to protect our coastal economies, oceans, marine wildlife, and fishing industry. This event will be held this Saturday, June 26th, at various locations worldwide. Go to the beach at 11 AM in your time zone for one hour, rain or shine. 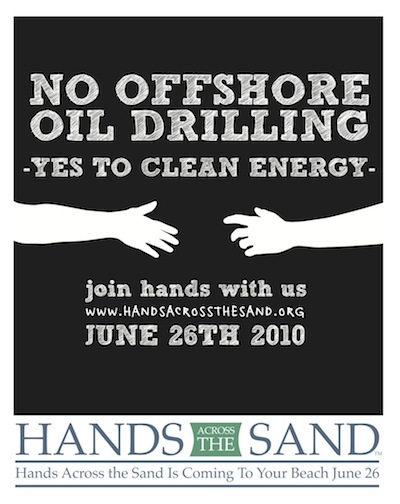 Join hands for 15 minutes at 12:00 forming lines in the sand against oil drilling in our coastal waters. Don’t live near a beach? Not a problem! There are organizers who have scheduled solidarity events at the same time. Use this link to find the even nearest to you! The image is powerful, the message is simple. NO to Offshore Oil Drilling, YES to Clean Energy! Comments Off on Join Hands Across the Sand on June 26th! Moonlight, Sea Turtles and You! Live near Fort Lauderdale? Visit the Museum of Discovery and Science for a moonlight look at nesting turtles! In this summer program that started Tuesday, June 16th, your evening begins at the museum at 9 p.m. for a one-hour presentation on nesting, threats to turtles and conservation. The presentation is followed by a short drive to the Marriott Harbor Beach Resort in Fort Lauderdale. While participants relax on lounge chairs, the program administrators comb the beach in search of nesting turtles. Once they spot a turtle, the program scouts relay information to museum staffers waiting with the participants. Turtle watchers get to see the mother-to-be after she has begun the nesting process. The program is called “Moonlight, Sea Turtles & You”. For more information, visit the Museum of Discovery and Science website events calendar for more information. Seriously, how neat is that? Definitely worth a look if you’re visiting Fort Lauderdale! Comments Off on Moonlight, Sea Turtles and You! Sea Turtle Next YouTube Sensation! I’m not one much for Cloverfield style movies, but for those of you who can stand it, you should check out this clip. It appears this turtle’s fin got caught in a yellow strap attached to a waterproof camera. The sea turtle somehow turned the camera on and filmed itself for 5 minutes while moving along its merry way. This clip has had over 2 million views, but I couldn’t watch more than 2 minutes of it. Shaky cameras are not my thing, but like I said, if you can deal, check it out. Comments Off on Sea Turtle Next YouTube Sensation! BP may be cleaning up their oil spill, but they might be doing more harm than good in their efforts. A Louisiana shrimp boat captain hired by BP was captured on video saying that BP was burning up turtles and other marine life as part of the other oil slicked ocean debris. The Los Angeles Times reported on what is now being called the “Death by Fire” incident June 17, click here to read the story.